East winds during the night kept temperatures 15 to 20 F warmer than they were yesterday morning across the metro area, including TUS and DM. Surface plot above (from MesoWest) is for 06:00 am MST this morning. The WRF-NAM forecast made at 06:00 am yesterday morning at Atmo - below, valid at same time as observations above - picked up on the much warmer trend fairly accurately. Cold air has held sway at lower elevations. Lows here were 26, 24, 24, 22, and 25 F for past five days, ending this morning. Maximum gusts for past 24-hours (below, from MesoWest via NWS web page) show that winds were not as strong as expected, except at Mt. Hopkins (74 mph max). 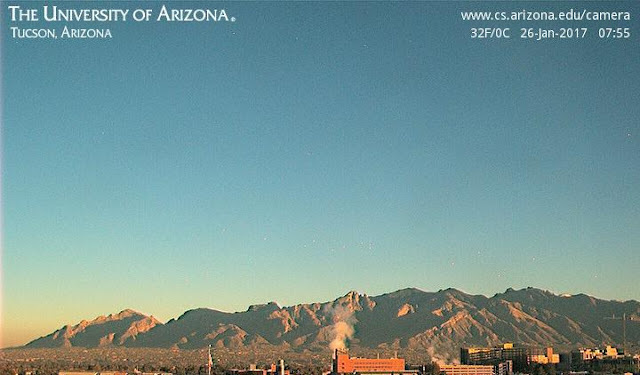 I noted gusts around 50 mph at Kitt Peak yesterday but can't get to their web page this morning. Winds on Mt. Hopkins have been gusting over 40 mph for much of the day, beginning around 10:00 pm MST last evening. Max gust recorded was 74 mph between 07:00 and 08:00 am this morning. Snip above starts at 19:19 last evening and ends at 14:19 (both LST) this afternoon. 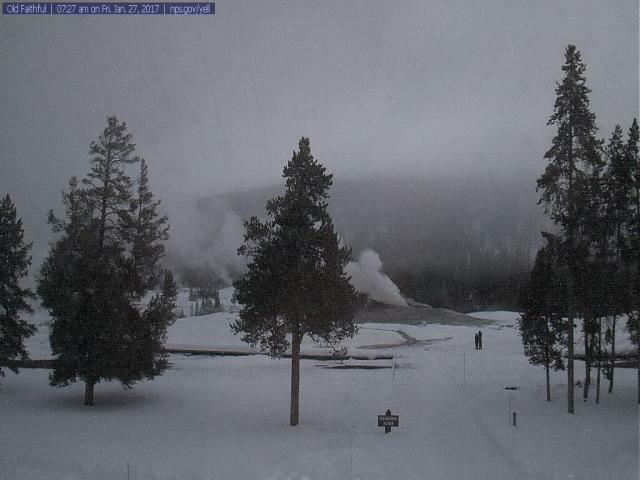 Couple waits in the cold dawn this morning for Old Faithful to do its thing. Little change in model forecasts from yesterday. Another cold and frosty morning here with a low again of 24 F.
The GEFS plumes from 06 UTC last night are flatlined for QPF at the airport (above). The models do forecast a nice warming trend (below) beginning tomorrow with the downsloping east winds, and continuing through next week. Frosty morning view of Catalinas above - temp on campus indicated as 32 F. Morning low here was 24 F with moderate frost. For the last two days the WRF model forecasts from Atmo have been indicating strong easterly winds for the weekend. The forecast below is from the 06 UTC WRF-GFS run on the 1.8 km grid and is valid at 11:00 am MST on Saturday morning. Many mountains and lee areas indicated to have steady winds in the 30 to 40 mph range with several spots south of the border even stronger. Shown here are high-resolution grid-box forecasts for: above - Tucson airport; below - Mt. Hopkins RAWS site; and second below Kitt Peak. The wind gusts at airport are forecast to exceed those on Mt. Hopkins, which is not going to happen. Kitt Peak has a forecast for winds over 40 mph - strongest of the three series shown. Here are two forecast soundings for Sonoita from the 06 UTC WRF-GFS, upwind from the Santa Ritas - above is valid at 01:00 am on the 28th and below is valid at 01:00 am on the 29th. Model time series indicates an extended wind event for Mt. Hopkins, with gusts of greater than 40 mph beginning tomorrow afternoon, reaching high speeds of 60 to 80+ mph at times from middle of Friday night into Sunday. The last time I tried to forecast severe winds for Mt. Hopkins, the model forecasts were overdone and I had a bad forecast. Forecasts have remained consistent as this event approaches in time, so I'm trying again. Cold trough at 500 mb dominates the West this morning - 12 UTC analysis above from NCAR shows -29 C at Tucson and -33 C at Flagstaff. Lows this morning were quite chilly: 20 F at Empire RAWS, 23 F at Sasabe RAWS, 26 F here at house with heavy frost, 31 F at DM, and 32 F at TUS. We used to track quite close to the lows at Empire, but there's been local development and considerable tree and plant growth, so that microclimate of what was once open deserty yard has warmed, but an amble down to the wash takes one into Empire type temperatures. As the cold, midlevel air moved overhead late yesterday some short-stubby Cbs and showers developed. The radar above (base scan from NCAR) is for 06:15 pm MST. Image below is stolen from Art Rangno's blog (link to the right) and shows showers south of Catalina area about 05:53 pm. Ended up with very light shower here at house after dark, giving us a Trace for the day. 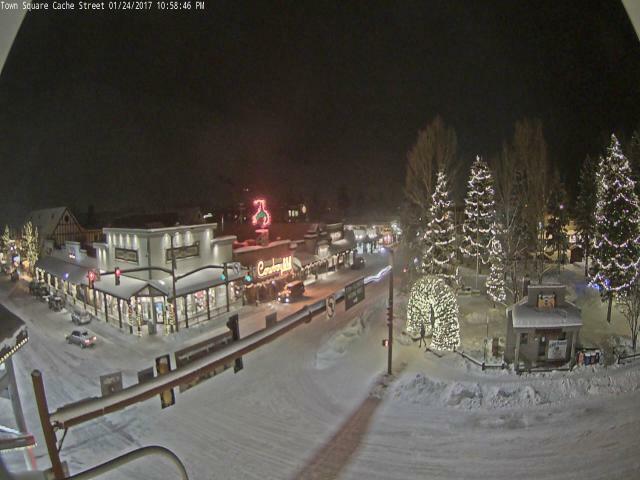 Finally, Jack Hales webpage (link also to right) has a sublink to a widespread mosaic of webcams that is always interesting to scan. Some locales have enough lighting that nighttime images can be viewed. 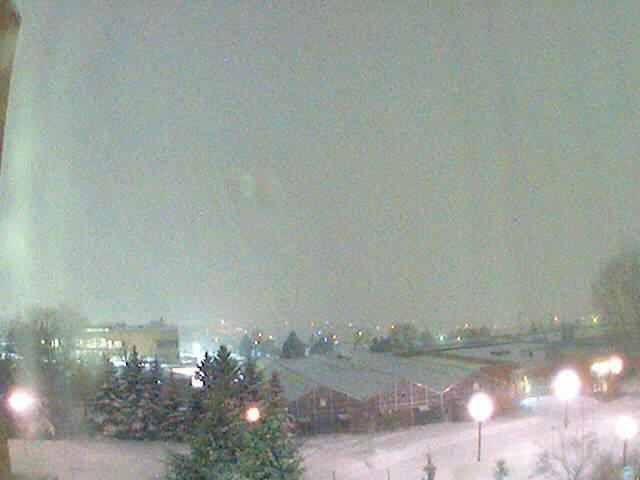 Here are two pre-sunrise images - above from Jackson, Wyoming, and below from Rexburg, Idaho. Rexburg is along Idaho Highway 20 between Idaho Falls and Ashton to the northeast, at the start of the upper Snake River country. My dad was born in Ashton, so it's not surprising that we often headed for Island Park area and some summer fishing. His father was a dry-land wheat farmer in the Ashton area and was hailed-out two summer's in a row - he gave up on the farming and moved the family to California, just before the 1930's Depression knocked most everybody down again.. Thunder, lightning, and hail were influencing my life well before I was born. Last night's event evolved pretty much as forecast by the WRF-GFS, shown in previous post, with a generally light rainfall event at lower elevations of the Tucson area. The plot above shows 24-hour rain amounts at 05:00 am MST this morning across northern 2/3rds of the ALERT network. Amounts in metro area generally from less than a tenth to around a third of an inch. There was only 0.13" here at the house. Two sites appear a bit suspect - Coronado Camp with 1.18" and Italian Trap with 1.54" - but perhaps believable, since nearest neighbors are over half an inch. Winds across southeast Arizona gusted in the 30 to 40 mph range. Pioneer Airfield hit 49 mph and the exposed RAWS site at Guthrie recorded 65 mph. This morning at 500 mb the western trough and cold temperatures prevail (above GEFS average valid at 12 UTC), but by the weekend a significant ridge builds over the western US and Canada - forecast below valid at 05:00 pm on Saturday, January 28th. Arizona remains under the western tail of the eastern US trough, so that we look at a cool week, with perhaps a bit of unsettledness around Friday. 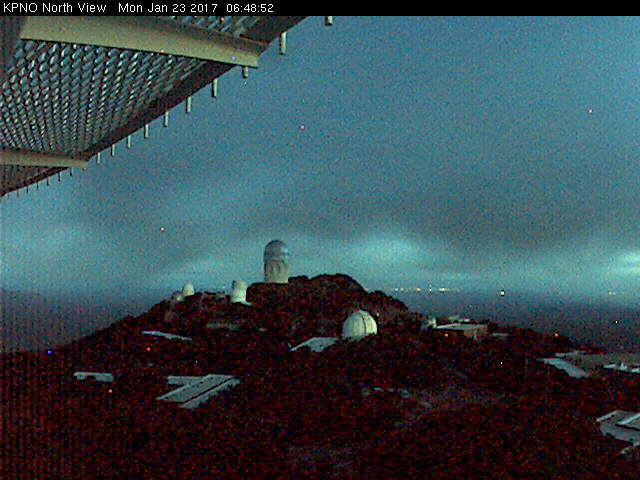 View from Kitt Peak above is looking north at a bit after 06:45 am MST. The lights in distance are probably Casa Grande and it appears that there may already be some light showers occurring out there. The forecast models continue to forecast a fast-hitting precipitation event tonight, along with gusty winds and a strong cold front. The QPF plumes for Tucson airport (from the 06 UTC GEFS forecasts) above indicate a tight clustering in time for tonight, with amounts ranging from about 0.20 to 0.40". 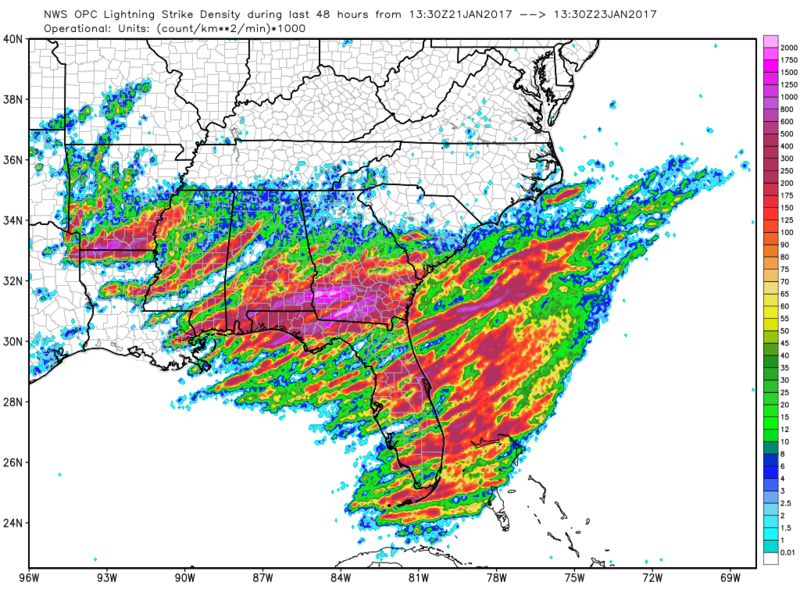 The 06 UTC forecast from the WRF-GFS run at Atmo (below - forecast of total precipitation through noon tomorrow) indicates light amounts at low elevations. Over the weekend a deadly tornado outbreak struck the Southeast US, causing widespread destruction and about 20 deaths. The plot just below (from weather.graphics and Vaisala) shows CG flash density for the past 48-hours. Severe thunderstorm and tornado reports from SPC for Saturday are shown at bottom. Very nice morning today (Sunday, January 22nd). 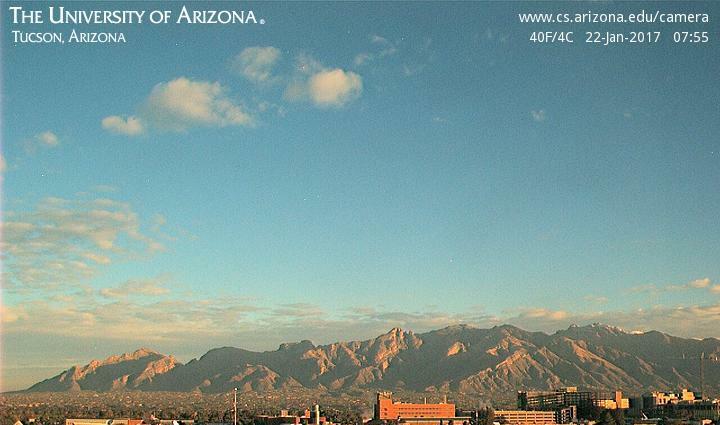 A bit of the snow cover at high elevations of the Catalinas is just visible at right edge of webcam view from campus above. Low temperature here at the house was 32 F, and yesterday's sprinkles didn't add to the Saturday am precipitation total of 0.58" here. Another strong Pacific cold front will pass through our area tomorrow night and perhaps bring a bit more rain at low elevations. Strong southwest winds will again occur in advance of this event - 06 UTC WRF-GFS forecast of 10-m winds above is valid at 02:00 pm MST tomorrow afternoon (orange-red tones are wind speeds of 30 to 40 mph). Models currently forecast a rapid event during Monday night that will produce only a few tenths of an inch at lower elevations, but with more snow for the Sky Islands. Surface plots here are from the 06 UTC WRF-GFS. Above is valid at 10:00 pm tomorrow night, indicating some light rainfall across the metro area. The forecast below is for 06:00 am on Wednesday morning and indicates cold morning lows in parts of the Tucson area. The model also nicely captures the warmer, banana belt zones along the foothills of the Sky Islands. The current weather event blew through very quickly and has mostly ended for Pima County, much earlier than forecast. When I went for newspaper, at 04:30 am MST this morning, stars were out and only a few clouds were scudding by. The time series above is from Atmo for T and Td (vertical grid is in 5 F increments with top line of grid being 60 F) - it shows the event occurred in two distinct segments (three if you count the light showers at sunrise yesterday). Showers produced light, but measurable rains from around 07:30 to 08:30 pm at Atmo. 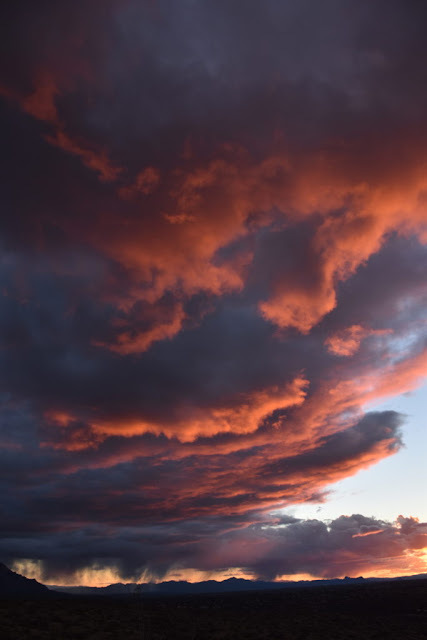 But the main event occurred as the cold front approached and passed through eastern Pima County, beginning a bit after midnight and continuing until around 03:00 am. This morning's TWC sounding and the 06 UTC WRF-GFS forecast indicate a continuing chance for some light showers this morning. The regional radar chart (below from NCAR RAP/RAL) is for 01:05 am and shows strong echoes moving through parts of eastern Pima County - DM AFB reported thunder, heavy rain and gusts to 56 mph at about 01:15 am. As I usually point out - this NCAR radar product is built using the KIWA and KEMX base scans, which reduces its representativeness, because of the serious terrain blockage around KEMX (Tucson radar). Graphic that is second below (from weather.graphics and Vaisala) shows CG flash density for the 12-hours ending at 05:30 am this morning. 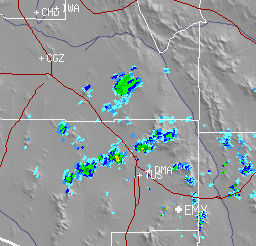 Most thunderstorm activity occurred over south-central Pima County. Although none were reported to SPC, it is likely that a few storms right along the front were severe due to convectively enhanced wind gusts. The two panels here show ALERT rainfall (top is northern portion and bottom is southern portion) for 24-hours ending at 05:00 am this morning. Redington Pass and the northwest flanks of the Catalinas had heaviest rain amounts that were well over an inch. There was a strong precipitation gradient, as forecast by Atmo's version of the WRF-GFS, from southwest of the airport northeastward to the Catalinas. The WRF-GFS forecast for the airport was far superior to that from the GEFS ensemble system, which considerably over-forecast the event at the airport. Here at the house we had 0.58". The airport reported only 0.25" and DM had 0.33". Art Douglas reports 2.67" early this morning, but no snow, at his place in Ash Canyon - Carr RAWS just up to his north reported 2.16". Snow amounts unknown at this early hour. Wind gusts of 40 to 50 mph were common - some higher gusts I noted were: Muleshoe Ranch and Gutherie RAWS sites had 67 mph, while Pioneer Airfield reported 58 mph. There have been light showers here in the north part of the City this early morning and they are continuing, with coverage perhaps increasing a bit. Yesterday we had some sprinkles around and there was a Trace here at house. Took a quick look at 06 UTC model forecasts for today and tomorrow's event. The WRF-GFS forecast of total precipitation though midnight tomorrow night is shown above. Most significant accumulations are forecast for the Sky Islands. The forecast amount for airport is now 0.4" but with significant gradients north and northeast of airport, where amounts increase. Snow amounts forecast on the Sky Islands are substantial and reach 1 to 2 feet. The model also forecasts very strong winds tonight into tomorrow morning. The 10-m wind forecast below is valid at 02:00 am on the 21st. The very strong winds are downslope at many locations within the 1.8 km grid, and the impacts on precipitation amounts are clearly evident in the blue shades over southeast Arizona (above). The GEFS plumes for QPF at the airport (bottom from 06 UTC) are considerably higher than the forecast from WRF-GFS. However, based on previous posts and comments it is not clear exactly how amounts are interpolated from nearby grid points to the airport location. The nearest four grid points are at higher elevations, so the lower amounts for downslope areas in WRF are not surprising. The numerical forecasts of QPF continue to be somewhat inconsistent, reflecting the difficulties inherent in forecasting this most important parameter. Mike Crimmins somehow chased this issue down and sent the graphic shown below. 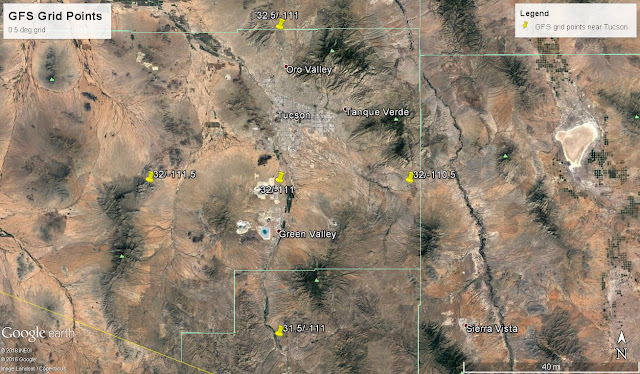 Appears the closest grid point to airport is off to its south-southwest - west of I-10 and a bit northwest of Sahuarita - fairly close and only a bit higher in elevation than airport. Mike - thanks so much for sending this! Pat Holbrook asked: Bob...what's the lat/lon/elevation for the GFS point that the EMC GFS is using? Click on text box for more readable font size. The QPF plumes (above from 06 UTC last night) are interpolated from 0.5 degree grid point forecasts to the airport location. However, this could be done using just the four closest grid points, or for more nearby points using a distance-weighting function of some sort. I could not find an answer regarding the exact procedure employed. Based on the statement above about the GEFS procedures, I assume that both of these plume products (above - total snow accumulation and below - probability of snow) are derived from the forecast for the nearest 0.5 degree grid point (i.e., the crux of Pat's question), which could be located anywhere within about a 25 km radius of the airport. No big deal for the flatlands but very significant here. Where is the nearest grid point wrt TUS? Very important question and, again, I could find no precise answer online. So, if any reader knows the answer, please let us know. The global models continue to be very consistent, forecasting a series of Pacific short waves and cold fronts to cross the Southwest during the coming week. I've taken a quick look at 00 UTC WRF-GFS forecasts out through a week, even though that's a bit dangerous. The GEFS plumes for QPF at TUS (above from 06 UTC last night) forecast two 100 % events at the airport - one on Thursday night, rapidly followed by a more significant event Friday night into Saturday, and then there's a more scattered event at the start of next week.Several of the GEFS members are forecasting some snowfall at the airport - this was the case with an earlier event this winter that melted away as it got closer in time. The forecasts of the temperatures at 500 mb associated with these short waves is very impressive and very cold over Arizona. The forecast at top of these three panels (all on the 5.4 km grid) is valid at 03:00 am MST on 20 January; the one directly above is for 10:00 am on the 21st; and the forecast below is valid at 10:00 pm on the 23rd (next Monday). Temperatures with these short waves range from -25 C to colder than -35 C. I don't remember when 500 mb temperatures colder than -30 C last occurred at TWC. Just for fun, here are the model's forecasts of precipitation (from 00 UTC on the 1.8 km grid) out through the next week (i.e., 05:00 pm on Tuesday the 24th. Total precipitation shown above.. while forecast below is for snowfall during that period. The model forecasts some snow over the grasslands east of the Santa Ritas and also along I-10 at several places east of Tucson. Will watch how all this unfolds in the real atmosphere during what should be an interesting week.